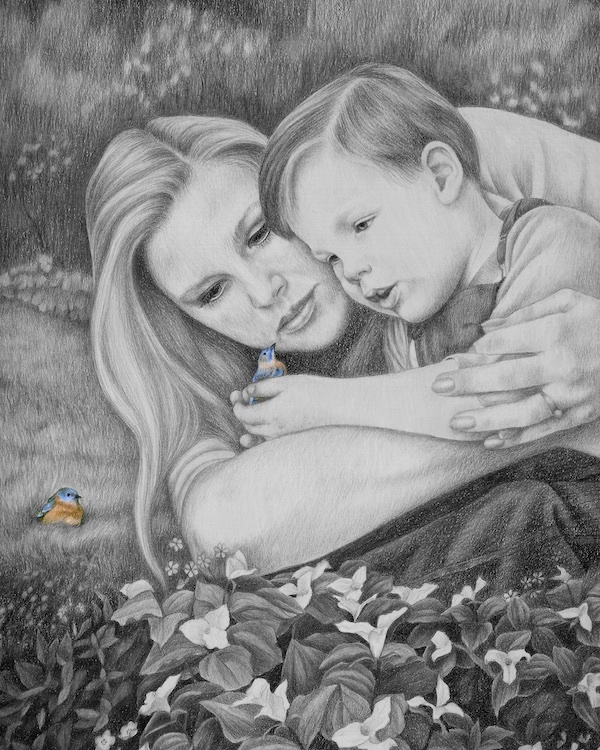 My 1984 illustration of Ann and my son Rob must be where my bluebird connection with her first began. Today is the anniversary of my younger sister Ann’s death. She died suddenly, of an undetected heart condition on October 9, 2008. It hardy seems possible that she’s been gone for seven years. When she made her transition she left a huge hole in my life. We spoke every day and spent as much time together as we could. The two youngest of unstable parents, we clung to each other growing up. Survivors of a shipwreck of a childhood, there was no one who nurtured and supported my recovery more than her. Life without Ann was hard. It’s not that I didn’t believe she was in a better place. I just missed our daily connection. I yearned for proof that she was still near me. The summer after she left, my heart ached as I packed for my family’s annual vacation to Martha’s Vineyard. Truthfully, I didn’t much feel like going. A friend had told me about seeing a red cardinal after her father passed in times of trouble or when she missed him. She believed they were sent by her dad to let her know all was well. To give my trip a sense of purpose I asked Ann to send me a bluebird when I was there to let me know she was alright. Although they inhabit the island, I had never seen one. If a bluebird crossed my path while I was there, I decided it would be a sign that she was near. When we arrived on the island, even its beauty couldn’t fully cheer me up. Everywhere we went my eyes scanned the trees for bluebirds without any luck. 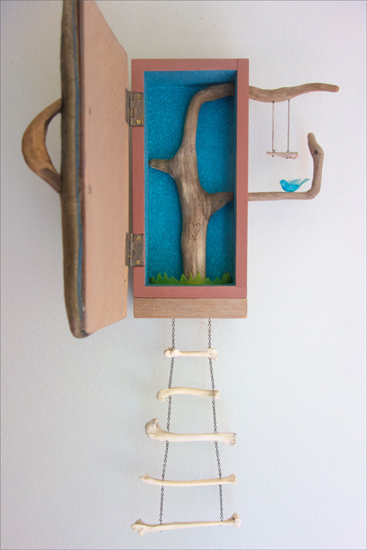 When my sister Laura brought me to her friend, folk artist Ashley Medowski’s gallery, I began to rethink the perimeters of how my bluebird would show up. On the gallery wall, with a red sold sticker on it, hung the most enchanting piece of art with a little bluebird on it. It was entitled, The Family Tree. A box with a door, made from a victorian photo album, opened up to a tree. Hanging stairs were attached to it to symbolize our assent to heaven and the rejoining of the loved ones who went before us. Laura knew how much I missed Ann and bought it for me. That gift opened me up to being flexible as to how the bluebird was going to manifest on my trip. Real or fashioned by a human hand, it didn’t matter. I accepted it as an assurance from Ann. 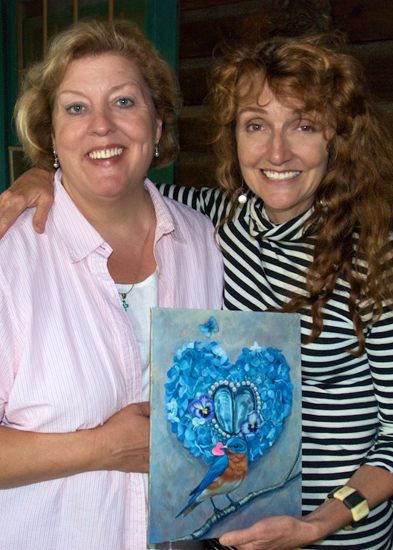 Later that week, I went to visit my friend, artist, Margot Datz. She wanted me to see an image she had painted with me in mind. 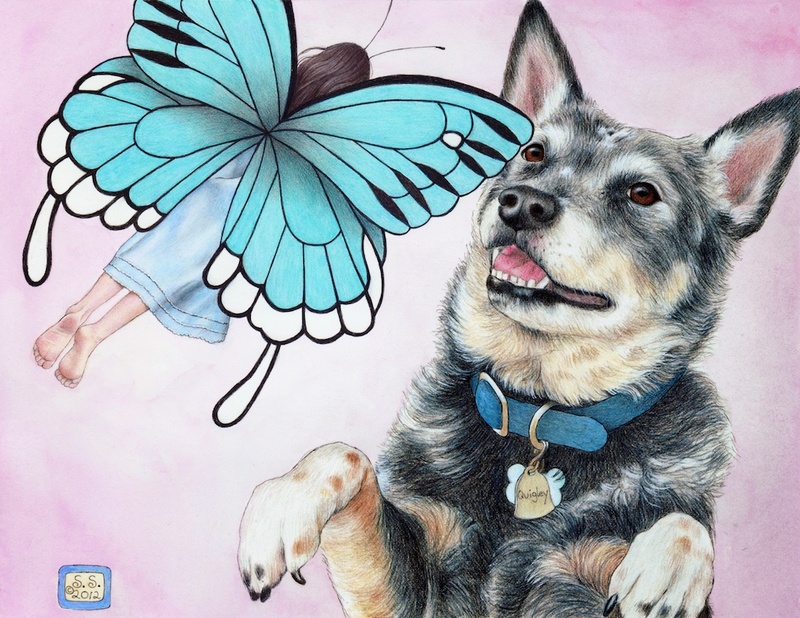 Inspired by the profundity of my loss she had named it, My Blue Heart. 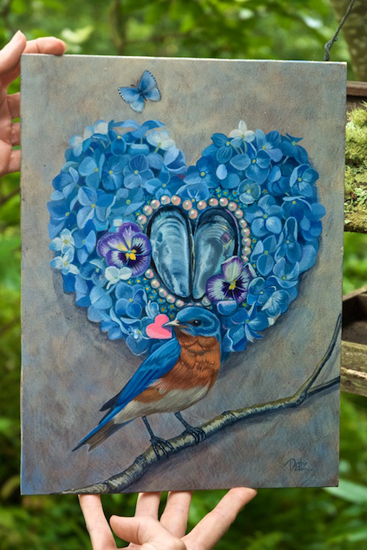 I couldn’t believe when I saw a bluebird holding a heart in its beak at the center of its design. Margot knew about my younger sister’s death but not about my quest for bluebird signs. I’ve glossed over many coincidences in my life, but it was hard for me to believe this was just happenstance. It had to come from Ann, through Margot’s paintbrush, to me. Today the painting hangs in my studio next to my drawing table. Me with Margot that summer. After I returned from Martha’s Vineyard, bluebirds were on my radar. It seemed like everywhere I looked I saw one and was reminded of Ann. I had let go of any hope of ever seeing a real eastern bluebird in my suburb of Chicago. Like me, no one I knew had ever seen one in our area. That all changed Sept. 29, 2014. 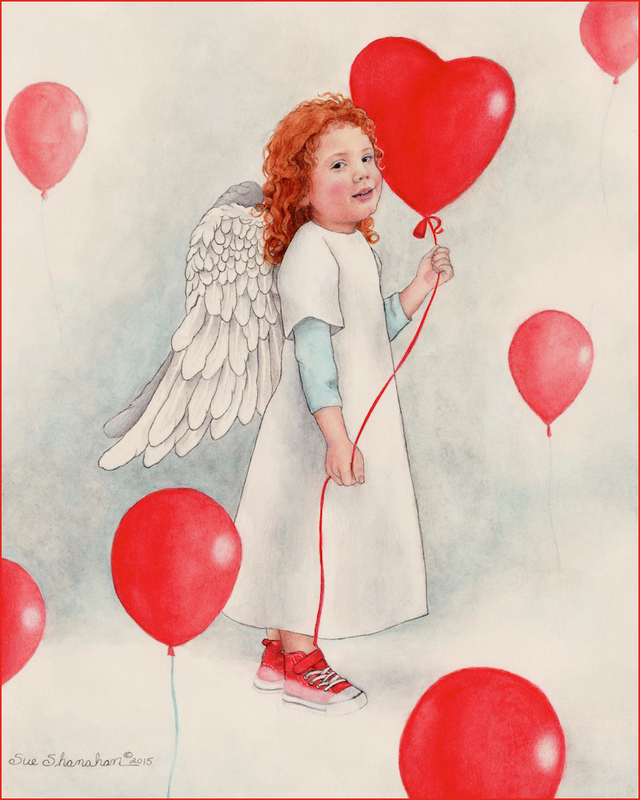 That day I was feeling discouraged about launching my children’s books and said a prayer for help. Not a minute later, I glanced out the window and saw what looked like an eastern bluebird! I couldn’t believe it. I went and grabbed binoculars to make sure it wasn’t just wishful thinking. Looking through them, I could clearly see a small cobalt blue bird with an orange breast eating seeds under our bird feeder. Then, as if to clarify my vision, it flew toward my window and soared away. Ann, one of my biggest supporters, had to let me know that everything was going to be all right. Of course there is no way to prove my bluebird assurances scientifically. Some may say my sightings are a product of an overactive imagination, but I know what I know. As the years move on, I no longer yearn for Ann like I did. Over time, other relationships in my life have deepened. The hole has been filled. I am at peace. I’ve found that no matter how much faith you have there is always an adjustment period when someone you love dies. Missing their physical presence takes time to come to terms with and be healed. Today, I’m happy for Ann. She is still with me, behind the scenes, supporting my journey. I know she is experiencing a world my mind can’t even begin to comprehend. I wish her Godspeed on the new adventures she traverses. She never was one for sitting still. Quigley, our funny little cattle dog. 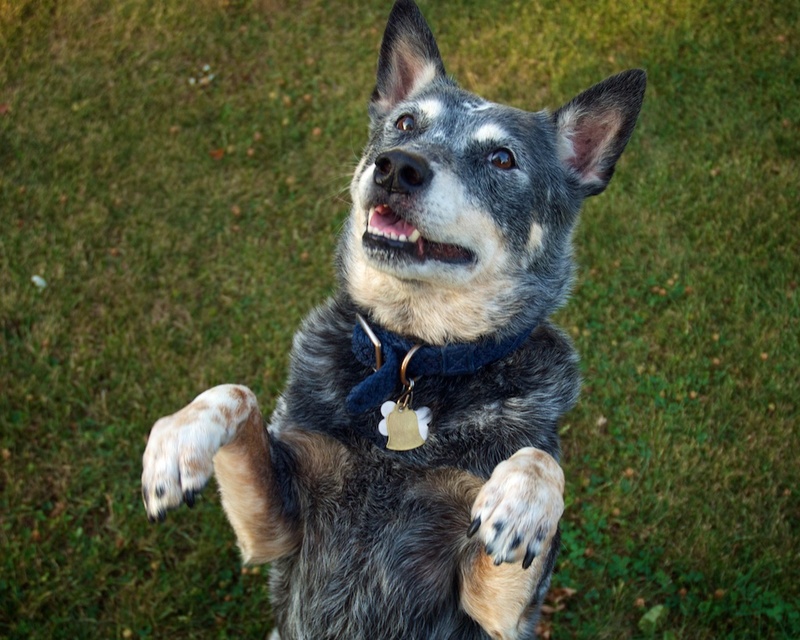 Last week it was time to put our Australian Blue Heeler to sleep. It was a difficult decision to make because Quigley was a part of our family. It was hard to imagine life without him. He was approaching 15 and in the past year his health had been steadily declining. It became apparent in his last few days that his body was shutting down. I didn’t want him to experience an ounce of suffering, so I prayed for guidance to know when it was his time to say goodbye. When that knowing came, I talked it over with the vet and made an appointment to bring him in the next day. As hard as it was to let Quigley go, my husband, Bob, and I knew it was the right thing to do. Quig came to us through a shelter after he had been dumped on a country road. Knowing that he had been abandoned, I vowed to him that I would take care of him. Putting him down was my final way of doing that. 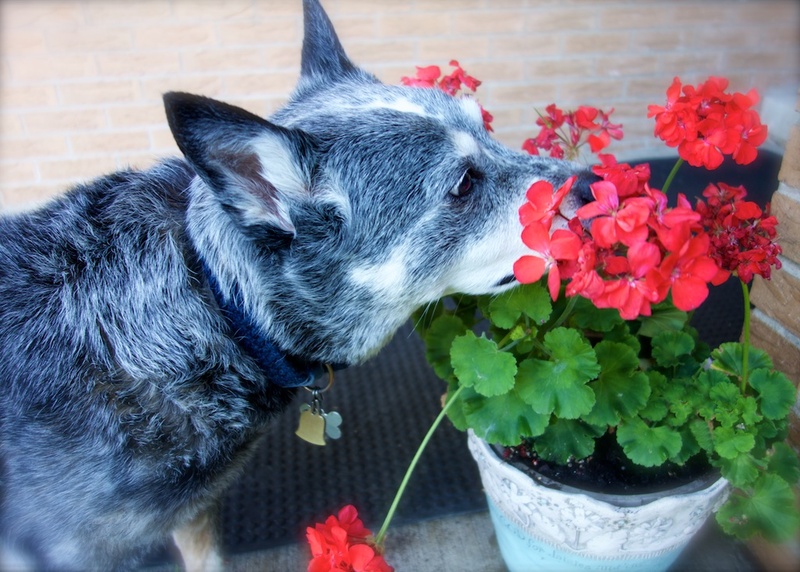 Quigley, on the day we put him down, smelling the flowers one last time. Quigley was the best dog we ever had. You don’t realize how much a pet fills your life until you experience the hollow place they leave when they’re gone. Now I yearn for the wonderful, little things about him. I miss hearing his toenails on the floors. I miss him laying by my feet. I miss how he took his leash in his mouth when it was time for a walk. I miss seeing him run for cover whenever he saw a fly. I miss how he loved to chase squirrels. I miss watching him pull my son by the sleeve to the cabinet where the dog treats were kept. I miss hearing him jump off the couch as I entered the room (he wasn’t allowed on the furniture). I miss seeing his little mug watching me through the window after I walked out the door. I missing watching him leap into the air to grab a frisbee mid-flight. I miss him falling on his back to have his belly scratched. I miss him bringing in the morning paper. I got Quigley to hold this pose by holding a treat up. He would do anything for a cookie. After Quigley was euthanized, Bob and I were heartbroken. We thought that maybe in a year we’d be ready to get another pet. Our hearts should be mended by then. 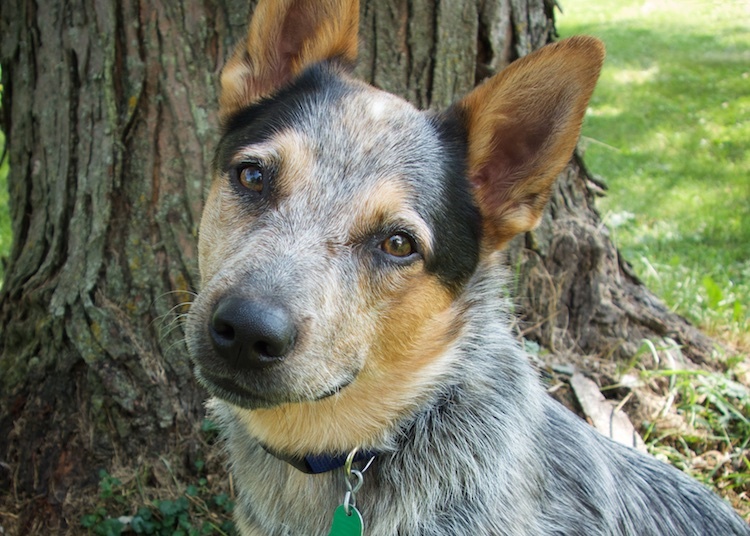 But without our cattle dog, our house is too quiet. That evening our son calls to check on me and suggests we get another dog. “Why wait?” he says. 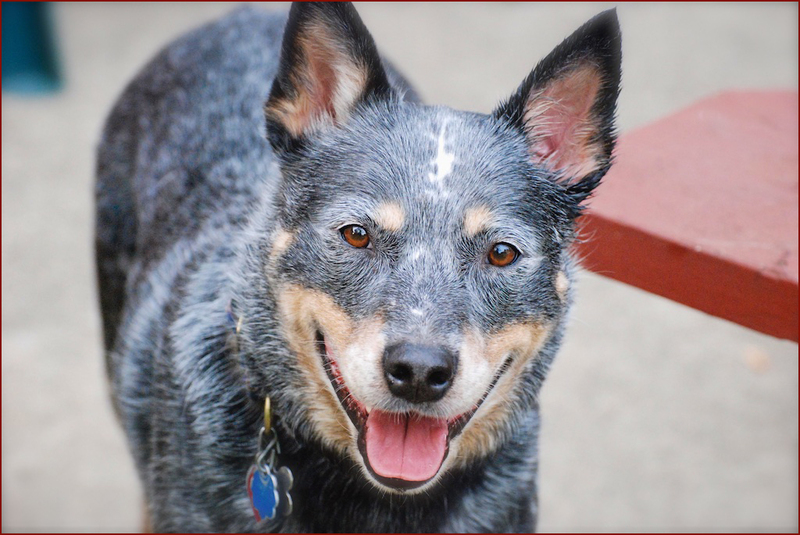 “There are so many dogs that need to be loved.” His words convinced me to look up the Australian Cattle Dog Rescue of Illinois. Even though we just put Quigley down a few hours ago, I filled out an on-line application. I thought finding the perfect dog would be a long process, so I’d better get started. Not too long after hitting send, I received an email from the president of the rescue. She informed me they would be having a dog meet and greet at a Pet Smart not too far from us the next day. She also told me of a red heeler named Maxwell that they had just gotten in. I decided to go to the meet and greet but not tell Bob. He was so adamant about not getting another dog for awhile. Besides when I saw a photo of Max I felt no connection to him. Shortly after I arrived at the Pet Smart, a lady walked in with the the cutest, little Australian Blue Heeler on a leash. Not Maxwell, another pup. When I went over to pet him, I learned she was his foster caregiver and had brought him for the rescue. When I heard that, I was sure he was our dog. I already loved him. His name is Gary and he is a stray from Ohio. He’s 8 months old, the same age Quig was when he came to us. I knew Gary was a gift. I proceeded to fill out the papers to adopt him. I’ll be able to bring him home in a few weeks after he is neutered and microchipped. On my ride back home I kept thinking, what have I done? I really should have talked it over with Bob before I adopted another dog. I felt such a sense of urgency to do it though. I knew Gary needed us. He was ours. My sister Ann passed away, without warning, on the morning of October 9, 2008. An undiagnosed heart condition, hypertrophic obstructive cardiomyopathy, took her life. How could that be? She was only 51! She all but sparkled she was so alive. Her death didn’t seem possible. Being thoroughly devoted to each other, I had no idea how I was going to live without her. For the first ten years of our marriages, I had the luxury of Ann only living a mile from me. We got to raise our children together and see each other whenever we liked. In 1998, her husband took a job three hours south of where we lived. I felt the sting of our separation even before she moved. When what I dreaded came to pass, I was shocked that our relationship only deepened. Even though we no longer got to be with each other in person, thanks to cell phones, we were connected more than ever. Ann and I had gotten into the habit of speaking to each other every morning and at times throughout the day, being detached from her was unfathomable to me. What would I do without her to run every aspect of my life by? There was such a hole with her gone. The minute I learned she had departed, I heard a voice say, “It’s time to stretch.” My soul knew it was a chance for me to face the world standing on my own two feet. The comfort of leaning on Ann had run its course. 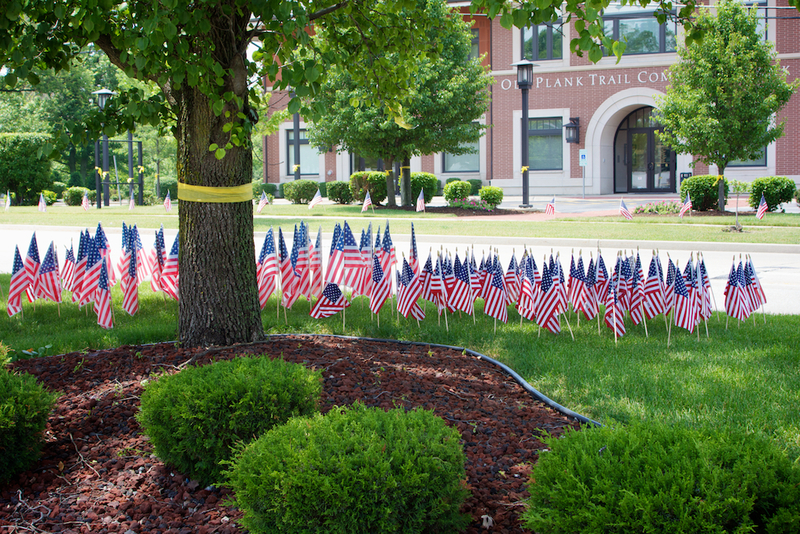 After the shock of her passing lifted, the grief settled in. I went from deep sadness to despair. Worse than my loss was witnessing what her husband and children were going through. Their broken-heartedness pulled me even further into misery. As the months moved on, slowly, slowly, I began to heal. I still remember the first day that went by where I wasn’t consumed with sorrow. As I lay in bed that night, a little pang of guilt pulled me back. Did my happiness mean I was being disloyal? And what about Ann’s children? I began to feel what I imagined their anguish to be. I was sinking. And then she came to me. Ann was in the form of an angel with wings. She reached down, lifted me by the hand and deposited me on a cloud next to her. If my body didn’t literally feel the whoosh of being pulled upward, I would have thought I was dreaming. As we sat, she put her arm around me and pointed down to Earth. She told me that whenever I felt myself slipping to look at the big picture. I knew exactly what she meant. I shouldn’t let myself become absorbed in the drama on our planet. In the big picture, nothing had changed. She had never left any of her loved ones’ sides. It was time for her to move on, but nothing could keep us from her love. She indicated to me that life would be so much easier if I wore my trials like a loose garment and didn’t allow myself to become engrossed in them. When looked at from a higher perspective, the sufferings we go through don’t seem so overwhelming. Ann’s insight was a gift from one who knew me so well. It proved to be the missing link in the healing of my many of struggles. That experience marked the beginning of my acceptance of what I had considered a loss. Sometimes I still ache for the physicality of Ann being with me, but I no longer resist these feelings. I simply let them move through me. They are part of being human. When I get to the other side of them, I realize nothing has changed…..not really. My cousin’s Marianne and Kate modeled to help bring my vision to life. Home is where the heart is. And the heart never really leaves home. The concept for my above christmas card, Home for the Holidays, sprang from my daughter’s imagination. 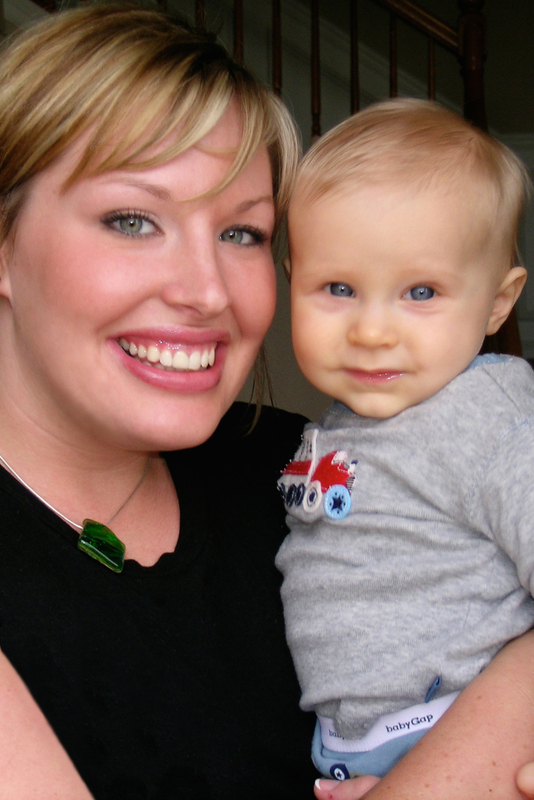 Fresh from college, Bridget was nannying for a baby named Jack at the time. She was crazy about him and thought up the design so her little muse could be included. My son Brian, found the model for the angel pulling the tree. He knew Marissa’s uncle and thought she was one of most endearing little girls he’d ever met. 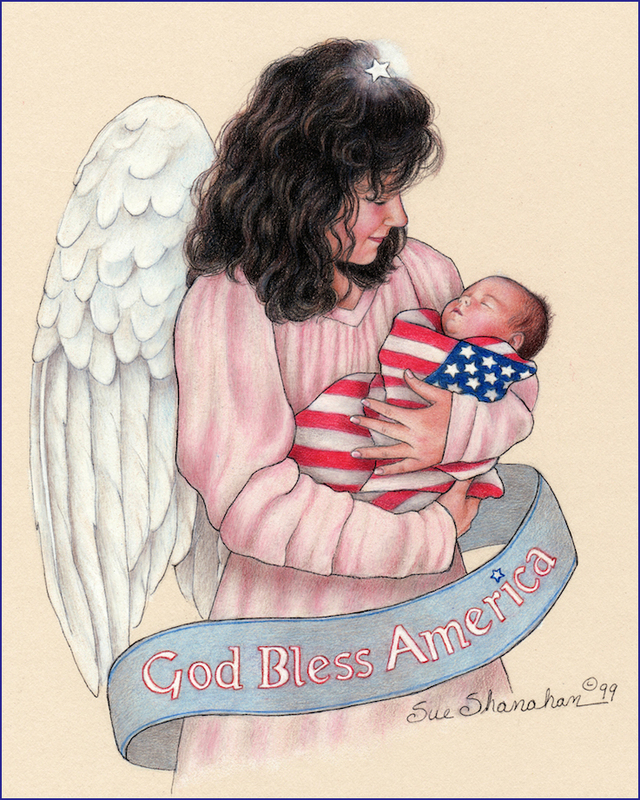 I was a little leery about a holiday card that focused on loved ones returning home. What about people separated by miles that for some reason couldn’t make it back? I thought how painful it would be for those who couldn’t be together because of war or worse yet death. 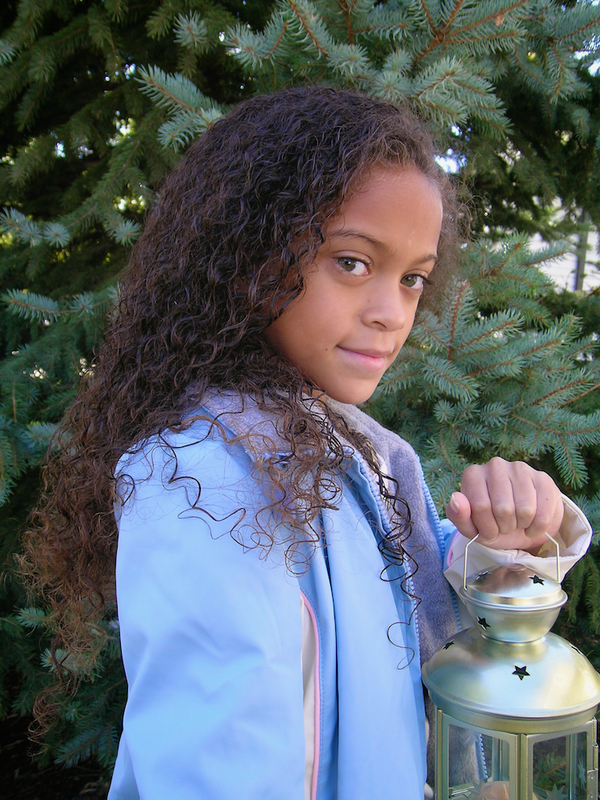 That year when Christmas came my own daughter would be halfway across the country in Idaho. I could already feel the sting. Difficult as it was, my daughter’s move taught me something. I learned being separated by the miles had little or no baring on our relationship. We were closer than ever. Computers and cell phones brought me to the realization that being with Bridget in person is wonderful but only one aspect of our love. Our hearts were connected even though we were miles apart. In 2009, when my sister died suddenly, it took that notion to a whole different level. The first Christmas without her was brutal. We were so much a part of one another it felt as if she had been ripped from me. As the years passed, I’ve settled into life without her in the flesh. I’ve adjusted to having a different kind of relationship with her. It took working through the grief to get to this point. Even though we are seemingly apart, we are closer than ever, just like with Bridget. For awhile our souls inhabit these bodies, but our true selves are connected at a higher level. Real separation from anyone we love is not possible for they are entwined in our hearts. So in this season of joy and throughout the new year, I wish you the luxury of knowing all your loved ones are home. And in fact, they never left. Bridget and Jack way back when.